Google has now started the rollout the final build of Android 7.0 Nougat to Nexus devices everywhere, and in most cases that means you’ll just be installing an over-the-air update on the phone itself with a few taps. But if for some reason you might want to start completely fresh and install one of the factory images that Google provides, we’re here to help you do that. Note: This guide assumes you already have your phone’s bootloader unlocked and the ADB tools installed on your computer. If you need the ADB tools, head over and download the Android SDK, and if you need to unlock your bootloader, keep reading. Before we get started, we need to make sure that your device is visible to your computer. Type the command “adb devices” in your Terminal application; if you see your device listed, you’re ready to go. If not, make sure your device has ADB debugging turned on. If you know that your device is already unlocked, feel free to skip this section and keep reading. Otherwise, you need to make sure your phone’s bootloader is unlocked before you can flash a factory image. 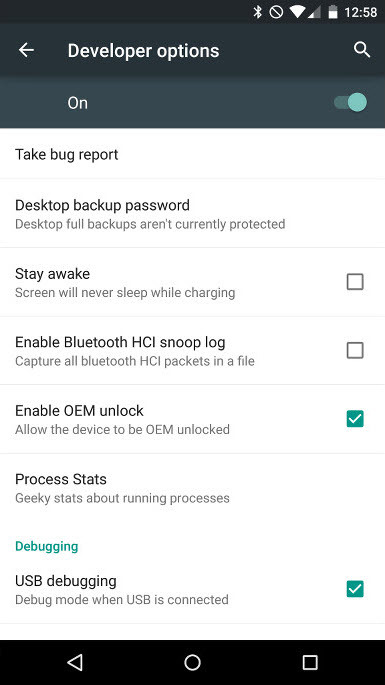 Bootloader locking is a security feature that requires that your device be completely wiped when going from a “locked” state to an “unlocked” state. For this reason, there’s no way to keep your data if your bootloader is locked (unless you’re going through the new Android Beta program). If you need to unlock your bootloader, go to the Settings app and head to the “Developer options” (if you don’t see Developer options, go to the “About” page and tap the Android build number several times). Make sure that “OEM unlocking” is checked. Next, Use the command “adb reboot bootloader” to go to the device’s bootloader and check if your device is in the locked state. If the bootloader on your Nexus device is locked, make sure your device is at the bootloader screen and use the “fastboot oem unlock” command. After this, you should see some prompts on your device to confirm that you do indeed want to unlock your bootloader. After you confirm this, your device is going to be completely wiped and you’ll be ready to move on with this guide. If you haven’t already, grab the latest build of Android Nougat from Google’s factory image page. Once you’ve downloaded the .tgz file, extract it. Inside the extracted .tgz file there will be a .zip file titled something like “image-volantis-nrd90m.zip” (Nexus 9), and after you extract that file, you’ll find the boot loader, OS image, vendor image, and a radio image (depending on your device). You only need to follow these instructions if you want to keep your data, otherwise the flash will format your device and all data will be lost. If your bootloader is locked, your data will have to be wiped anyway in the unlocking process as described above. If you don’t want to lose your data in this case, you need to restart your device and back it up manually. Note: It’s worth mentioning that modifying the flash-all script to save your data can sometimes have weird effects on your device as it leaves some code from your previous OS version untouched that can conflict with new code from the new factory image. It’s always better to just install fresh if you can. The “flash-all” script contains all of the commands necessary to flash the factory image onto your device. Before running it from the command line, you might want to remove the flag that wipes your data (although this isn’t ideal, you might run into problems especially if it’s a major upgrade). In the file you extracted you’ll find two flash-all scripts as mentioned above. The flash-all script with the .bat extension works with the Windows command line while the .sh extension works with the Unix command line (OSX, Linux, etc). Open up the proper flash-all script with your favorite text editor and remove the “-w” from the file. “-w” is an ADB flag which wipes all of the user data (the stuff we want to keep). Once you’ve made the change, save your file, and open up a command line program. As we did earlier to check unlock status, you need to boot into your bootloader to flash the factory image. Run the command “adb reboot bootloader” again to get there. Alternatively, you could start up the device while holding the volume down and power keys simultaneously to boot into the bootloader. Now point your command line to the file directory with the flash-all script. (Ex: cd /Users/<yourusername>/Downloads/hammerhead-lrx21o). For more help on using the command line, see this cheat sheet. Once you’ve pointed to the correct directory, run your script. Now you should see the script running on-screen. It’ll take a little over five minutes for the image to install. Once the image is installed, the script will automatically reboot your phone. The first boot usually takes a while, so wait about 10 minutes before assuming you’ve entered a bootloop. After the phone boots, you should have Android 7.0 Nougat and, if you opted to modify the flash-all script, all of your data should be intact.